1Department of Radiology and molecular Imaging, Sultan Qaboos University Hospital. P.O. Box 38, PC 123, AL Khod, Sultanate of Oman. 2Mallinkrodt Institute of Radiology. Washington University School of Medicine. Section of Abdominal Imaging. 510 S. Kings Highway Blvd. St Louis, MO. Address correspondence and reprint request to: Dr. Rashid AL Sukaiti, Department of Radiology and molecular Imaging, Sultan Qaboos University Hospital, P.O. Box 38, PC 123, AL Khod, Sultanate of Oman. AL Sukaiti R, Robinson K, Menias C. Retrospective Review of Cross Sectional Imaging Findings of Pancreatic Non-functional Islet Cell Tumor (NFICT) and its Hepatic Metastases. OMJ 2011 Jan; 26(1): 39-42. AL Sukaiti R, Robinson K, Menias C. Retrospective Review of Cross Sectional Imaging Findings of Pancreatic Non-functional Islet Cell Tumor (NFICT) and its Hepatic Metastases. OMJ 2011 Jan; 26(1): 39-42. Available from http://www.omjournal.org/fultext_PDF.aspx?DetailsID=60&type=fultext. Objectives: Review and correlate the computed tomography (CT) imaging features of pancreatic Non Functional Islet Cell Tumors (NFICT) and its hepatic metastases. Methods: CT examinations of 28 patients with pathologically proven diagnosis of pancreatic NFICT and no clinical symptoms or signs attributed to hormone overproduction, performed at Mallinkrodt Institute of Radiology, Saint Louis, Missouri, USA between March 2002-July 2006, were retrospectively reviewed by two abdominal radiologists. The imaging findings were analyzed and summarized. Results: Pancreatic NFICT size ranged from 1.2-13 cm. The commonest pattern of enhancement was hypervascular and heterogenous enhancement. The spleen was the commonest invaded nearby local structure. The commonest pattern of enhancement noted in the metastatic liver lesions was hypervascular heterogenous enhancement. 26% of the liver metastatic lesions were associated with invasion/encasement of nearby vessels. Conclusion: Imaging features of pancreatic NFICT can overlap with other pancreatic neoplasms. Therefore combining the imaging features of pancreatic NFICT and its hepatic metastases helps in narrowing the differential diagnosis. Keywords: Non Functional Islet Cell Tumor; Computed Tomogram; Hypervascular; Hepatic Metastases. Imaging features of pancreatic NFICT can overlap with other pancreatic masses. Given that the prognosis and treatment is different. It is very important to be able to diagnose this rare pancreatic neoplasm. We therefore describe the cross sectional imaging features of 28 patients with proven histological diagnosis of NFICT. Approval was obtained from the of Institutional Board Review at BJ Hospital, Mallinkrodt Institute of Radiology., Saint Louis Missouri, USA Computed tomogram of 28 patients (15 male,13 female)with pathologically proven diagnosis of Non-Functional Islet cell tumor of the pancreas performed at our institution between March 2002-July 2006, were retrospectively analyzed by two abdominal radiologists in consensus with regard to size, site of pancreatic origin, calcification, pattern of enhancement, local or vascular invasion and distant Metastases; size, number, pattern of enhancement, vascular invasion, and biliary ductal dilatation. The patients Ages ranged between 22-84 years old. The method of obtaining histological diagnosis included open surgical in 10 patients, image guided percutaneous biopsy in 15 patients, and endoscopic ultrasound biopsy in 3 patients. Imaging indication in these patients included: abdominal pain in 13 patients, abdominal mass, pain and weight loss in 12 patients, Jaundice in 2 patients and Incidental diagnosis in one patient. All CT examinations were performed with either 16 or 64 slice Siemens Scanners. Patients received 125 ml of Optiray 350 which was administered at a rate of 4 ml/sec with a power injector. 750 ml of water was administered 45 minutes prior to the study in order to achieve good distention of stomach and duodenum. An unenhanced scan was obtained initially followed by images acquired during both arterial and venous phase. Pancreatic NFICT size ranged from 1.2-13 cm. The patterns of enhancement were: hypervascular homogenous 4, hypervascular heterogenous in 24 cases (Table 1). 5 of the pancreatic NFICT cases had upstream dilatation of both common bile duct (CBD) and pancreatic duct (PD), 4 with only PD dilatation. The invasion of nearby local structures were: spleen 3, stomach 1, spleen, stomach and adrenal in 1 case. The remaining 23 cases had no local invasion 18 of the 28 cases had invasion of nearby local vessels, while the remaining 10 did not. 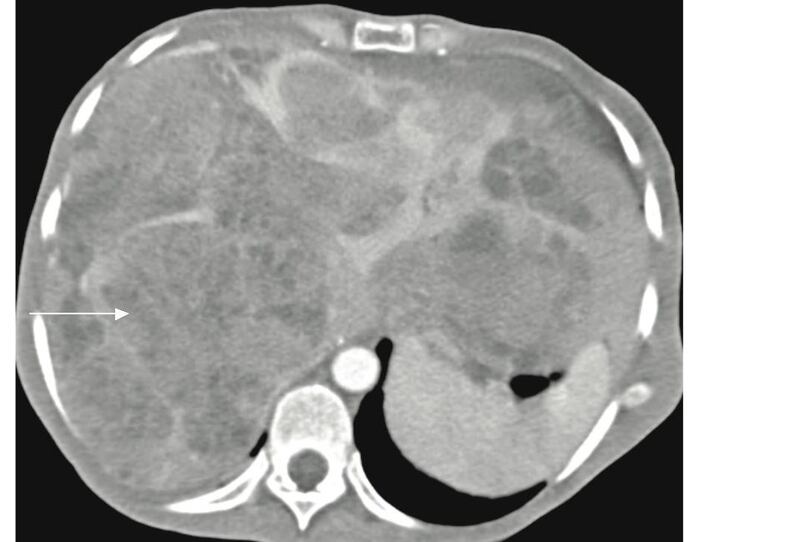 Metastatic liver lesions in the 19 cases ranged in size from 1-8 cm. Patterns of liver lesion enhancement were: hypervascular homogenous 4, hypervascular heterogenous with peripheral enhancement and central necrosis 15.5 of the 19 cases with hepatic metastases were associated with invasion/encasement of intrahepatic vessels. Table 2: Metastatic liver lesions: Imaging features. Figure 1: Pancreatic NFICT. Contrast enhanced CT shows a diffuse hypervascular homogenously enhancing mass involving most of the pancreas (white arrow). Figure 2: Pancreatic NFICT. 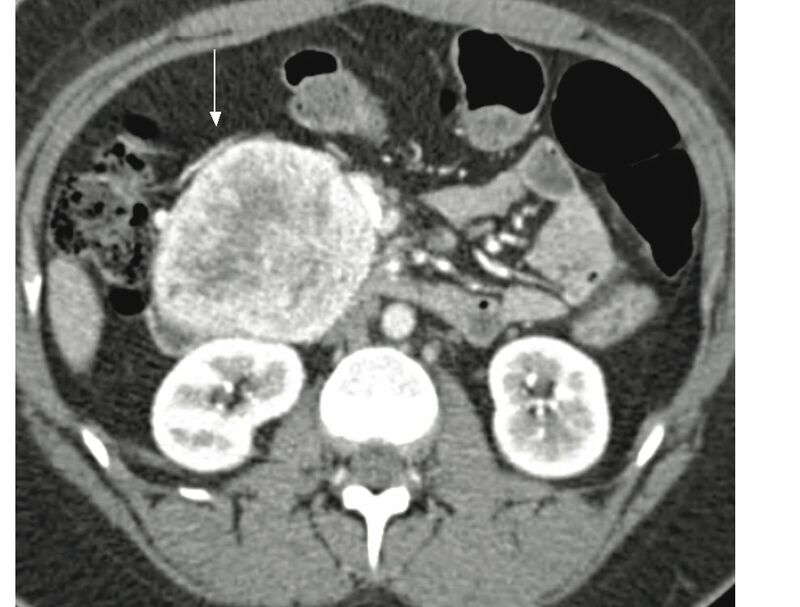 Contrast enhanced CT demonstrates a circumscribed heterogenously enhancing mass in the pancreas (white arrow). In our series the commonest imaging pattern was hypervascular heterogenous enhancement which is similar to what was reported in previous series.5-7 In our study coarse nodular calcification was present in up to 20% of cases which is consistent with previous data.5 Local invasion, vascular invasion and metastatic disease are more commonly seen with the larger tumors. Metastatic regional lymphadenopathy is seen in about 37%, while dilatation of pancreatic and common bile duct is present in 15% and 19% of patients with NFICT respectively. 5 Venous involvement by large NFICT is common with the three type of venous abnormalities being: venous occlusion, venous encasement, and intravenous tumor extension. 8 (fig. 3). The commonest venous involvement we encountered was venous occlusion and encasement. Celiac axis and superior mesenteric artery are rarely involved.5 Hepatic metastases are seen in 57% of these patients.5 Liver involvement is considered a major prognostic factor for survival.9 At CT, they typically demonstrate homogenous enhancement, peripheral enhancement with cental low density, and uniformly low density.5 (fig. 4,5). Figure 3: Patient with pancreatic NFICT. 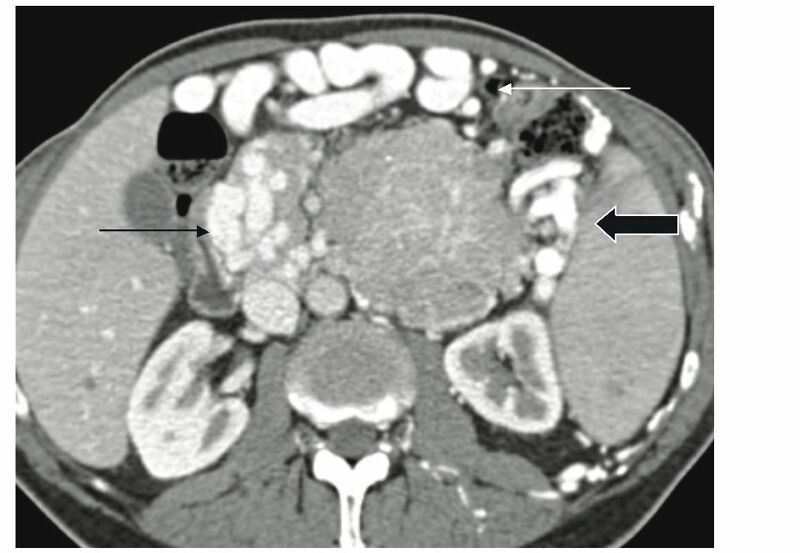 Large pancreatic heterogenously enhancing mass with superior mesenteric and splenic vein invasion (not shown) resulting in perisplenic (Thick black arrow), gastroepiploic (white arrow) and pancreaticoduodenal varices (Black arrow). Figure 4: Patient with pancreatic NFICT and hepatic metasteses. Two liver metastatic peripheral enhancing lesions with central area of necrosis (white arrow). Figure 5: Patient with pancreatic NFICT (not shown) with diffuse multiple hepatic metastases. 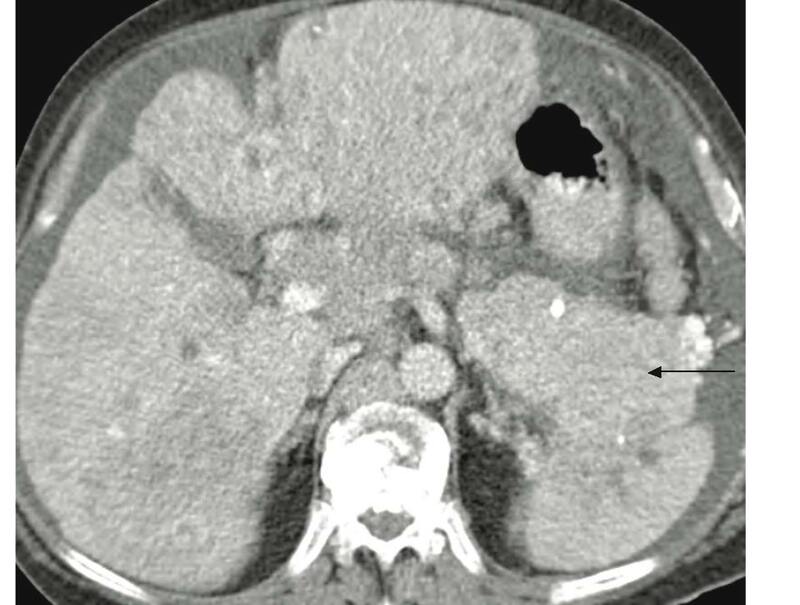 There are multiple large heterogenously enhancing lesions in the liver with areas of necrosis (white arrow). 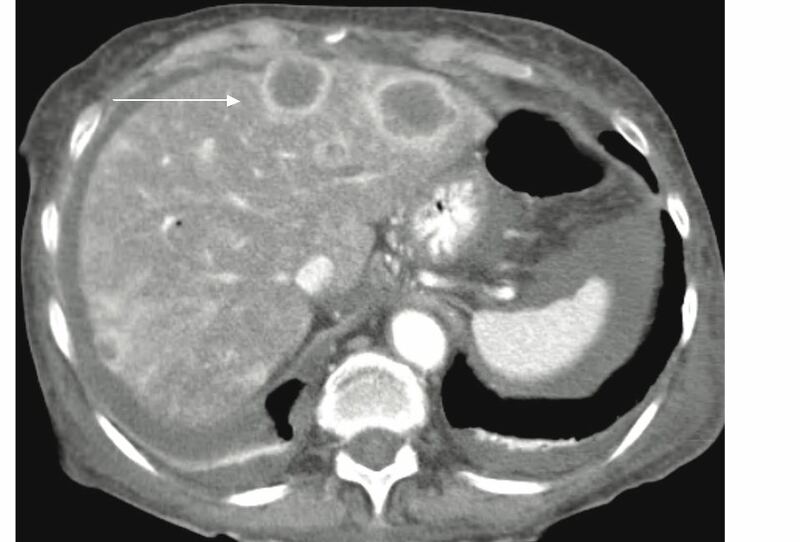 In our series the commonest metastatic liver lesion imaging pattern was hypervascular heterogenous enhancment with areas of low density indicative of necrosis. We also observed a pattern of innumerable diffuse small metastatic liver lesions with mixed hypodense and heterogenous enhancement resulting in pseudo-cirrhosis appearance (fig. 6). Pancreatic ductal adenocarcinoma is the commonest malignant pancreatic neoplasm accounting for approximately 85% of pancreatic neoplasms. They usually occur in patients in the seventh decade with a distinct male predominance. At CT, they typically appear as low attenuation masses that invade adjacent vessels.10 Lymph nodes metastases are frequently present. Solid Papillary epithelial neoplasm occur almost exclusively in women, the majority of whom are in the second and third decades. At imaging, they appear as well defined solid masses with variable degrees of cystic degeneration.11 Peripheral calcification are seen in a third of tumors. 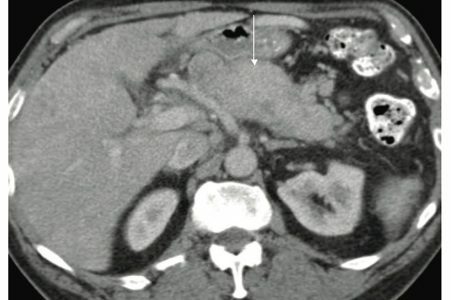 Figure 6: Patient with pancreatic NFICT and multiple small hepatic metastases. There is a heterogenously enhancing mass in pancreatic body and tail (Black arrow). There are multiple diffuse small hypodense and heterogenously enhancing lesions throughout the liver resulting in pseudocirrhosis appearance. The differential diagnosis of islet cell tumors commonly includes pancreatic adenocarcinoma and solid papillary epithelial neoplasm, and to a lesser extent a mucinous cystadenocarcinoma. Accurate diagnosis of the specific type of pancreatic tumor is important in terms of prognosis and management. Due to overlapping imaging features, combining the imaging features of pancreatic NFICT and its hepatic metastases will aid in narrowing the differential diagnosis. An FNA or excisional biopsy is often required for histological diagnosis. Roche A, Raisonnier A, Gillon-Savouret MC. Pancreatic venous sampling and arteriography in localizing insulinomas and gastrinomas: procedure and results in 55 cases. Radiology 1982 Dec;145(3):621-627. Horton KM, Hruban RH, Yeo C, Fishman EK. Multi-detector row CT of pancreatic islet cell tumors. Radiographics 2006 Mar-Apr;26(2):453-464. Buetow PC, Miller DL, Parrino TV, Buck JL. Islet cell tumors of the pancreas: clinical, radiologic, and pathologic correlation in diagnosis and localization. Radiographics 1997 Mar-Apr;17(2):453-472, quiz 472A-472B. Dahnert W. Radiology review manual 4th edition. Phyladelphia, PA: Lippincott Williams and Wilkins, 2000; 602. Eelkema EA, Stephens DH, Ward EM, Sheedy PF II. CT features of nonfunctioning islet cell carcinoma. AJR Am J Roentgenol 1984 Nov;143(5):943-948. Furukawa H, Mukai K, Kosuge T, Kanai Y, Shimada K, Yamamoto J, et al. Nonfunctioning islet cell tumors of the pancreas: clinical, imaging and pathological aspects in 16 patients. Jpn J Clin Oncol 1998 Apr;28(4):255-261. Buetow PC, Parrino TV, Buck JL, Pantongrag-Brown L, Ros PR, Dachman AH, et al. Islet cell tumors of the pancreas: pathologic-imaging correlation among size, necrosis and cysts, calcification, malignant behavior, and functional status. AJR Am J Roentgenol 1995 Nov;165(5):1175-1179. Bok EJ, Cho KJ, Williams DM, Brady TM, Weiss CA, Forrest ME. Venous involvement in islet cell tumors of the pancreas. AJR Am J Roentgenol 1984 Feb;142(2):319-322. Janson ET, Holmberg L, Stridsberg M, Eriksson B, Theodorsson E, Wilander E, et al. Carcinoid tumors: analysis of prognostic factors and survival in 301 patients from a referral center. Ann Oncol 1997 Jul;8(7):685-690. Tabuchi T, Itoh K, Ohshio G, Kojima N, Maetani Y, Shibata T, et al. Tumor staging of pancreatic adenocarcinoma using early- and late-phase helical CT. AJR Am J Roentgenol 1999 Aug;173(2):375-380. Buetow PC, Buck JL, Pantongrag-Brown L, Beck KG, Ros PR, Adair CF. Solid and papillary epithelial neoplasm of the pancreas: imaging-pathologic correlation on 56 cases. Radiology 1996 Jun;199(3):707-711.